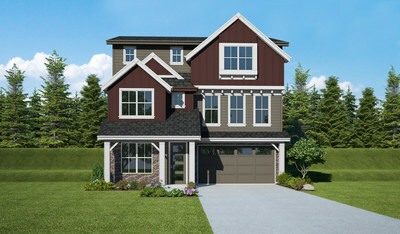 SEATTLE, Jan. 30, 2019 /PRNewswire/ -- Century Communities, a leading national home builder, announced today that Seeley Lane, one of Seattle's newest luxury urban communities in Richmond Beach, will host a grand opening celebration Saturday, Feb. 2 from 11 a.m. to 5 p.m. at 1237 NW Richmond Beach Road, Shoreline, WA. The public and real estate brokers are invited to enjoy refreshments, tour the community and beautiful new model home. Seeley Lane is an enclave of nine new luxury homes in Richmond Beach starting in the $900s. Homebuyers can choose from two– and three-story homes that range in size from 2,566 to 3,179 square feet, with options that include 3-5 bedrooms, 2.5-4 baths, and 2-car garages. These innovative and classic home designs include sweeping great rooms with large, bright windows, sliders which flood the open space with natural light, contemporary gourmet kitchens, inviting fireplaces and outdoor living spaces for entertaining. John Merlino, Century Communities' Washington division president, said, "This is a desirable neighborhood in a fantastic Richmond Beach location. Seeley Lane is ideal for Seattle commuters, and anyone who enjoys the natural beauty of Puget Sound." Situated in coastal Richmond Beach in Shoreline, Seeley Lane is nine miles north of Seattle and close to many urban amenities. Two elementary schools, a middle school and high school are within a quarter-mile to less than one-and-half miles away. The city of Shoreline enjoys a unique history and character dating back to its original settlements in the late 1800s. Over the years, the Shoreline community has become renowned for strong neighborhoods, excellent schools and abundant parks.